The original DF8 is a handsome beast. 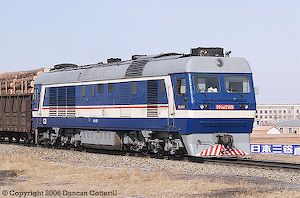 This is DF8 0135 on the Harbin - Mudanjiang line in March 2006. Many of the original machines are based at Mudanjiang and work freight traffic to Harbin and Jixi. The DF8B has a distinctive appearance but lacks the good looks of its predecessor. 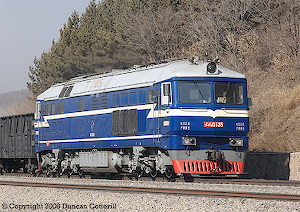 DF8B 5149 was photographed near Zhalainuoer in the far north west of Harbin Bureau where the class are currently displacing DF4B from freight work. The DF4 doesn't have a complete monopoly on heavy freight operation but there aren't many other designs in the running. From 1989 to the mid 1990s, Qishuyan works produced around 140 DF8 class Co-Co diesel electrics specifically for heavy freight work. These locos are powered by a 16 cylinder 16V280ZJ engine, similar to the unit used by the DF4 but with an increased cylinder bore. This gives a power output of 3310 kW, about 36% more than that of the contemporary DF4B. The first 41 went to Zhengzhou Bureau to work the mountain section north of Wuhan. Since electrification they have been redeployed to the Wuhan - Jiujiang line and can also be seen on trip workings around the Wuhan area. The rest of the class went to Harbin Bureau where they are based at Mudanjiang and spend most of their time hauling coal from the Jixi coalfield towards Harbin. An updated version, classified DF8B and rated at 3680 kW, has been in production from 1997 and is currently the locomotive of choice for heavy freight work. Both Qishuyan and Ziyang are building DF8B in quantity with over 700 now in traffic, the majority Ziyang built. Locos are numbered DF8B 0xxx for Qishuyan locos and DF8B 5xxx for Ziyang machines. These locos have a new, more angular body than the original DF8s and the two subclasses are easily distinguished. DF8B are in widespread use and are particularly prevalent on the Beijing - Tianjin - Shenyang route. A number of DF8B variants have been produced in very small numbers including what Qishuyan calls the "Magic Boat in Snow Region" locos for use on the high altitude Qinghai - Tibet Railway. There is also a DF8CJ prototype with variable frequency 3-phase AC drive.